I noticed this sitting on one of the many piles hiding the front counter at Dark Carnival while having my big post-xmas book haul being rung up. On a whim, I threw it on the pile. I had initially thought my nephew might enjoy it, but he found enough books of his own and I ended up keeping it for myself. It's a nice 80s paperback that I banged up too much. I really don't like these designs, but age and rarity have made it much more appealing to me and I regret somewhat my rough handling, but it had to be read. 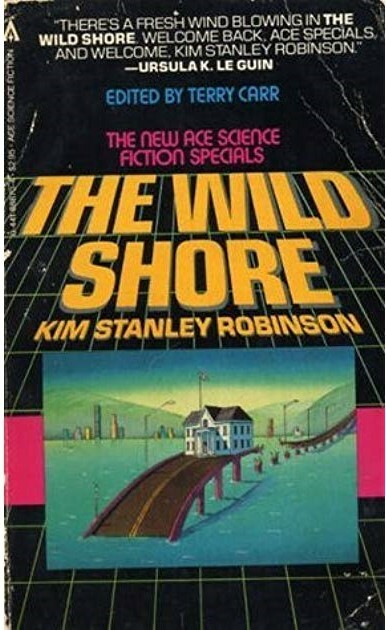 This is Kim Stanley Robinson's first published novel. I don't know if this was the first place it was published, but it is part of a revival of the Ace Science Fiction Specials with an introduction by Terry Carr. He talks more about the science fiction genre in the early '80s than the book itself, complaining about the popularity of generic sci-fi using rehashed plots. It doesn't go into any depth, but is nonetheless an interesting glimpse into the ongoing tension between art and commerce in the genre at that time. The Wild Shore is definitely a post-apocalyptic novel, and has many of the themes and situations that I enjoy in the genre. It takes place in southern California 60 or so years after a major nuclear attack reduced America to rubble and the remaining Americans to a hardscrabble frontier existence. The community of Onofre works hard at fishing, farming and surviving after having built up a small foundation of civilization. They also trade with neighbouring communities, including the gypsy-like scavengers, who choose to survive by living off the ruins. There is a twist, though, we learn about a third of the way in. America was actually the loser in the war and the rest of the world may be going on in its modern way, embargoing and quarantining the United States. The Japanese control Catalina and patrol the coast, sending misilles from satellites anytime Americans build up too much infrastructure. Japanese adventure tourists may be smuggled on shore and hosted by the scavengers. This the young man Henry learns when he meets two travellers from the much larger San Diego to the south, travellers who also tell of the resistance. It's a cool concept and it gets explored in the book, though not thoroughly. The Wild Shore is more about a young man faced with difficult choices and making some bad ones and about the community around him and how it works together and deals with these changes. Normally, I would prefer to stick with the setting and adventure stuff, but everything seems very realistic here and I got caught up in it. Likewise, Robinson's style can be too straightforward and at first there seemed to be a lot of telling but as the novel progresses, you realize there are layers to the narrative. It is also about writing itself, especially at the end. I found some very inspiring passages that really captured the pain and magic of trying to write. There are two other books that follow this one, though I felt that this one was wrapped up very nicely. I will keep an eye out for them, but don't feel the need to read them to find out anything more that happened. It might even spoil some of the magic of this book. What's interesting about the other books in this "trilogy" is that they're not a continuation of the story from The Wild Shore, but take place in alternate history versions of Orange County. There's one character that overlaps all three but they branch out and tell very different stories... The Gold Coast is a techno-dystopian vision while Pacific Edge is utopian. Ah thanks, Steve. That is cool. I appreciate that instead of milking more story, the "trilogy" is actually thematic. Taking away the pressure to finish the story, makes me much more likely to read the other two. I am guessing the overlapping character is Tom.